The Landing of Brighton - Rochester, NY is good. The staff is very helpful, are there whenever you need them, and participate in activities so you get to know them. The food is fine and they do try to do different things. They have Italian night and tie it in with some of the things going on. There's always a menu for those people who don't like what's on the menu. There's always something going on here and outside of the building. They generally cost additional money, but they let you know ahead of time if you want to go to those things. They're very good about getting you to doctors or if you have an animal that has to go to the pet doctor, that's here too. You can have an individual room with a bathroom, there are all kinds of things going on, and things go on outside the building, but it's pretty much by choice. You can participate if you want to (or not). The Landing of Brighton's layout was very nice. The activities were good. It was certainly a community that we were considering. They had an activity room for group activities or games. They also had a bit more individual freedom, so you can do different activities in there, including playing a piano. The other thing that I really liked was that the meal times were not completely structured. The person who helped me was remarkable, and I didn't feel like I was being sold to because she was actually being helpful by telling me to look at other facilities. I really like her a lot. The rooms were very nice. I like The Landing of Brighton because it offered both assisted living and enhanced assisted living, as well as memory care if my mother needs it. She's doing some of the exercise classes there. She enjoys the fact that there is not a set mealtime. The dining room is open all day. If she wakes up late, she can still get breakfast. Unlike a lot of other places, they don't have assigned seating for the residents. They can come in and choose where they want to sit. They have music programs that enjoys where they do some sing-alongs and listen to music. There's quite a variety of activities. Housekeeping and laundry are included. The Landing of Brighton was absolutely fabulous and excellent. It was very high-end and off the grid, beautiful, and very luxurious outside and inside. They had huge activities for all types of people. If you're more active, you'd get more value because you could participate in some of the wonderful things that they offer. The grounds are absolutely beautiful with gorgeous flowers, beautiful landscaping, and beautiful views. They have nature trails that wind through and kind of wooded areas around it. It is just breathtaking. In the dining room, you order from a menu like you're in a restaurant and the food looks very quality, high-end, and top of the line. My husband is in The Landing of Brighton, and I like that it is clean, new, and attractive. The staff is well trained, caring, and consistent. The food is excellent, and their dining room is restaurant-style. They have many appropriate activities. My father-in-law is in The Landing of Brighton, and it fits him. They do everything but nursing home care. It's new, clean, and very nicely done, and everybody gets their own apartment. The staff is very nice. We ate excellent food with them in a dining area that felt like a restaurant with a menu every day for breakfast, lunch, and dinner. The staff goes and get the residents and brings them down if they can't come by themselves. They give you basically anything you want and have a movie theater, do board games and chess, have a puzzle room, and a room where they have activities for painting, etc. He has been there since January. It was not full, so he got in right away. They were compliant, and there wasn't any hassle getting in. I thought The Landing of Brighton was really nice. I had a chance to talk with the sales person, and she was wonderful. The rooms were very nice. I liked the place a lot. I was at lunch with them, and the food was phenomenal. It’s a nice, brand-new facility. I visited The Landing of Brighton. It was wonderful, but they did not provide the nursing services that my friend needed. I really like the staff. This community had a range of people that are very able, communicative, and active. We would have loved to have our friend there, but they didn’t have the nursing services. The kitchen staff came out to discuss the menu and the options, which were very good. The Landing of Brighton was very bright, clean, and looked friendly. I loved the place because it was newer and had activities that my mother would like. The best way to get to know a community is by scheduling a tour. See the facilities, meet the staff and residents, and get a feel first hand what it's like to live at The Landing of Brighton Assisted Living. The Landing of Brighton is located across from Buckland Park, just minutes from shopping, restaurants, medical facilities and cultural venues. This vibrant residence will feature a salon and barber shop, ample shared living spaces and a fitness center for physical therapy. And without the worries of transportation, housekeeping and snow removal, residents enjoy an active, more independent lifestyle. Atria Senior Living offers more than simply a place to live, creating vibrant communities that give seniors companionship, comfort and safety. When people come to The Landing of Brighton, they are taking the first step toward leading a richer and more fulfilling life. Each of our communities is a big family, and we invite individuals seeking senior living to consider joining us. Our thoughtfully designed community offers a range of senior living services to ensure a comfortable, confident lifestyle. The independent living option will enable you to connect with peers and enjoy an active lifestyle. You will enjoy the convenience of apartment-style living in one of our studio or one-bedroom homes, all of which feature in-suite climate control, kitchenettes and emergency alert systems. Just outside your well-appointed apartment await delicious dining experiences, daily opportunities to be active, and a warm community of neighbors and staff who, together, help you remain the independent person you've always been. The Landing of Brighton provides a lifestyle of choice, with industry-leading quality standards and care options that can be customized to your needs as they change. 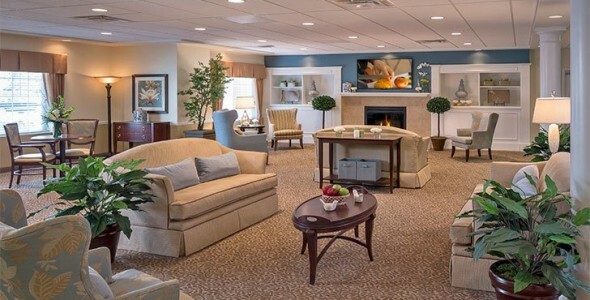 We provide discreet 24-hour assistance with day-to-day care needs, as well as innovative, personalized memory care for those living with Alzheimer's or other types of dementia – all backed by the industry-leading quality standards of Atria Senior Living. This vibrant residence will feature a salon and barber shop, ample shared living spaces and a fitness center for physical therapy. Each month brings more than 200 social, educational and cultural opportunities tailored to our residents' personal interests. People are living longer, and at The Landing of Brighton, we're helping them live better.